I spent a few years at sea, and I never came back from a cruise without having learned something new about the ocean or what lived in it. After retiring to Panama, I began to learn something new about the tropical savanna ecosystem nearly every day I stepped outside. I focused on plants, those marvelous signs of life. Now I'm in my second retirement, living in Sicily. I'm leaving my plant studies online for those who have found them useful. This entry was posted in Melastomataceae, To Be Identified and tagged Berry, Miconia rubiginosa. Bookmark the permalink. Something about it says Rubiaceae, and the plant looks like a Geophila, except I’m used to seeing red berries. 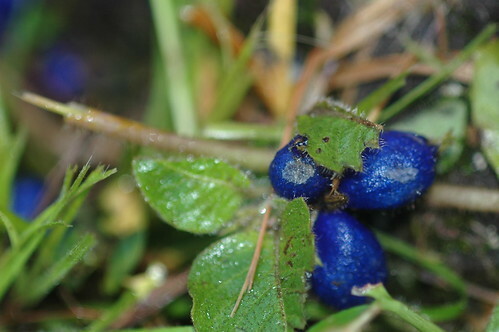 But I think dark blue/blue fruits may exist. Hope that helps. Yes, Psychotria cyanococca has electric blue fruits, but they’re all shrubs I thought. Plus the leaves are way different. 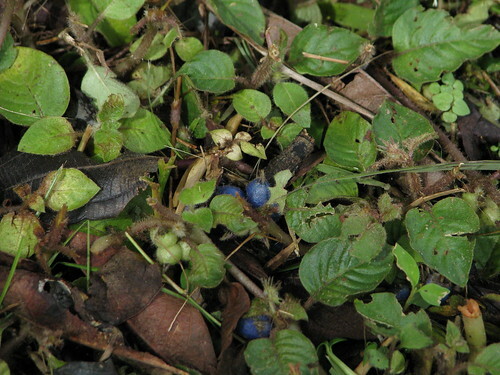 I did find an image of Geophila macropoda with dark blue fruits here. The leaves are closer, anyway, to mine. My next step is to pull out the Rubiaceae volumes from Flora of Panama and roll up those sleeves. Found something very similar during a trip to Trinidad before Christmas. How about the fruit of the Hot Lips plant, Cephaelis tomentosa? And it’s from the Ribiaceae. Yes, I agree, that the fruit looks a little like the fruit from Cephaelis tomentosa (aka Psychotria poeppigiana) but this plant is a ground-hugger and hot-lips is a pretty big shrub here in Panama. Still, I think your observation helps support the idea that this plant is in the Rubiaceae or coffee family. 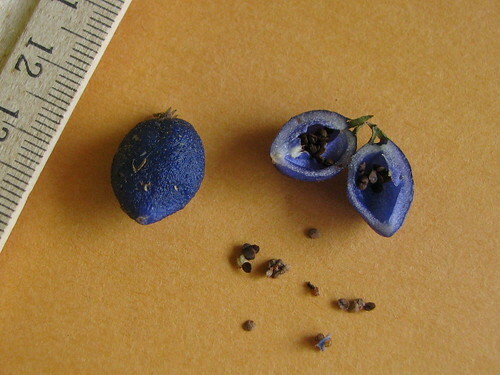 the blue fruits are the fruits of the rubiaceae Coccosypselum spec. Thank you, Dr. Meyer. Using your information, I was able to locate several images of the genus on Flickr. It’s satisfying to have a name.